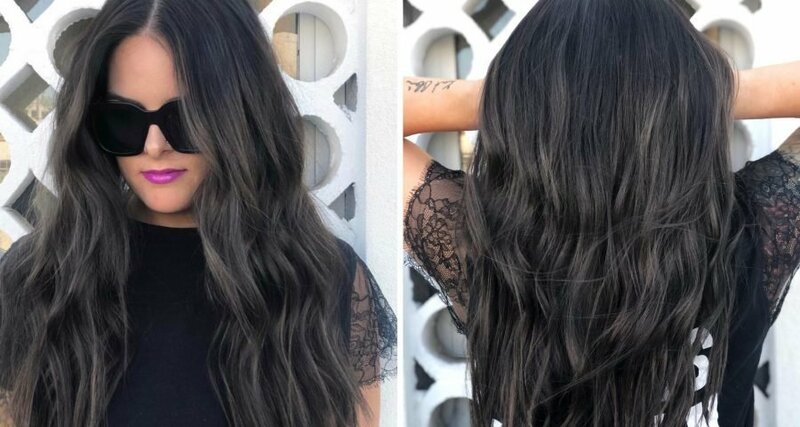 When a friend of Mallory Jade, an Arizona-based colorist, visited her salon recently, she gave her an extremely specific challenge for her dark hair. "I want a super natural look. Nothing chunky, but nothing super blended," Morgan told Mallory Jade. "I want pieces to enhance my face but everything else more low-key. It should be noticeable, but not super noticeable because I still want it to appear dark — something to just break all this up." To keep true to Morgan's request, Mallory Jade didn't give her friend the golden highlights typically used on dark hair to give it dimension. Instead, cool-toned balayage did the trick, and the unexpected solution turns out to be a low-maintenance way to freshen up dark brown and black hair. Cool-toned streaks checked all of Morgan's boxes because they mimic the bluish-silver undertones of her ebony hair. Plus, they look so natural and subtle that you almost don't realize they're there. However, you can tell they're doing their job because her hair doesn't look like one solid color, as it did before Mallory Jade worked her magic. Instead, the balayage gives her hair depth and fluidity. "When you add dimension to dark hair, it shows more movement throughout the hair," the colorist tells Allure. To create Morgan's look, Mallory Jade painted lightener on one-third-inch sections randomly throughout her hair using upward strokes. The bottom section of her hair was left untouched by the bleach to enhance the effect of the balayage. The upward strokes also help give a seamless finish, Mallory Jade adds. After the balayage processed, it was time to amp up the cool tones. First, Mallory Jade applied a blue-based silver toner to Morgan's roots with a technique called smudging. This step "demolishes any warm lines of demarcation from lightening," the colorist explains. Then, she toned Morgan's hair all over with a smoky silver shade to neutralize any other yellowish color from bleaching. The maintenance for the cool-toned balayage is about as low-key as the overall look. You can go up to six months between salon visits, Mallory Jade says. "But if you want to keep up with it and continue to keep the pieces where they are at, I would say eight to 10 weeks in between appointments would be ideal."